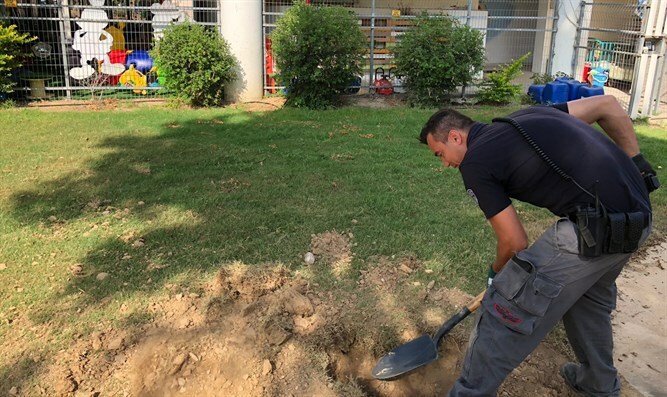 Rocket found next to kindergarten in southern Israel following overnight attacks. 'A matter of luck' that no one was hurt, says IDF. A rocket launched from the Hamas-ruled Gaza Strip landed next to an Israeli kindergarten early Wednesday morning, an IDF spokesperson said. Overnight, terrorists operating out of the Strip fired 45 rockets and mortars at Israeli towns in the western Negev. At least three of the rockets exploded in Israeli towns in the Eshkol Regional Council near the border. While there were no reports of injuries, several buildings sustained damage in the attacks. On Wednesday morning, pieces of one of the rockets were found next to a kindergarten in the Eshkol region. “Hamas fires indiscriminately at Israeli civilians, including at kindergartens,” and IDF spokesperson said following the discovery Wednesday. Police were called to the scene, and closed down the area surrounding the school. A police bomb unit recovered the remains of the rocket, ensuring that the projectile was fully neutralized. In response to the attacks overnight and a string of incendiary balloon and kite attacks in recent days, the IDF hit dozens of terrorist positions across the Gaza Strip.